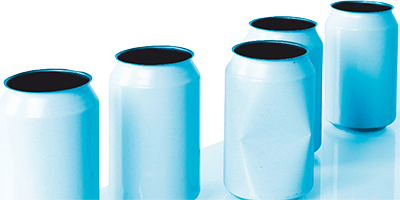 Empty cans in top form: safety and efficiency when filling cans. 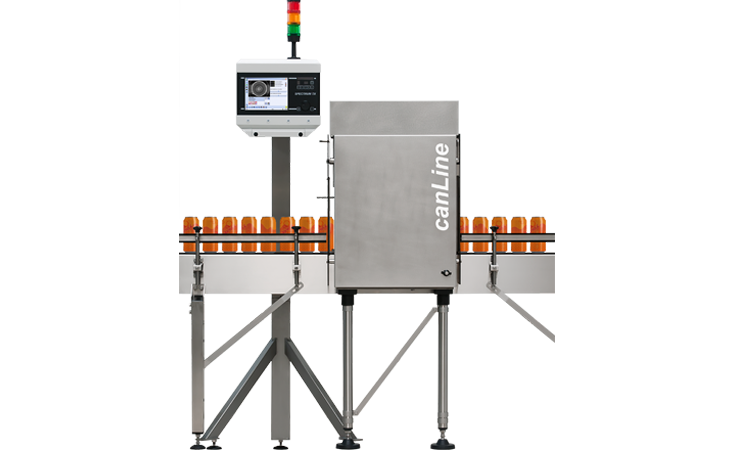 Detecting faulty empty cans and removing them before they can thwart the productivity of the filling line and present a threat to the health of the consumer: this is definitely achieved with the HEUFT canLine. 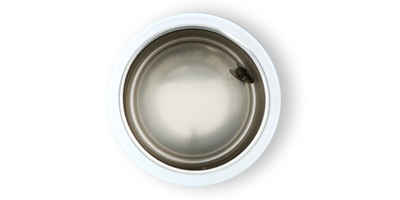 The empty can inspector only allows those drinks cans to pass which are clean, undamaged and uncontaminated and can be filled and sealed perfectly and without a problem. Finding deformations and damage early enough: reliability and efficiency on the canning line. Deformed, distorted and damaged: such empty cans can cause obstructions in the filler / closer system and paralyse the efficiency and productivity of the complete line if they are not rejected in good time. The HEUFT canLine prevents this. It removes distorted containers just as reliably as empty cans with indentations and defects at the flanged edge. 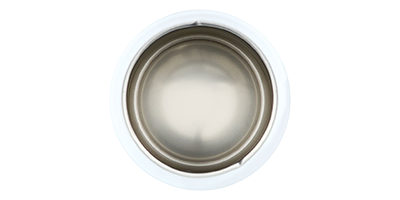 In addition the compact system identifies foreign objects and contaminants on the inner wall and the base of the cans – using a powerful top-down camera and an illumination free of shadows and reflections. 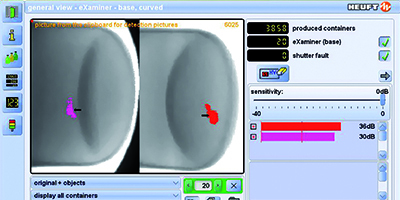 The HEUFT reflexx2 image processing system analyses the detection pictures in real time and implements a specific teaching in procedure for maximum detection reliability with a minimum false rejection rate. Changing automatically: brand changes at the push of a button. Brand and format changes are the order of the day along canning lines. The height and position of the detection units as well as the passage width of the guide rails in the inspection area of the HEUFT canLine automatically adapt themselves to the changed container shape so that they can be carried out quickly, easily and without errors. All the brand adjustments are permanently stored in the system and can be reproduced at any time. 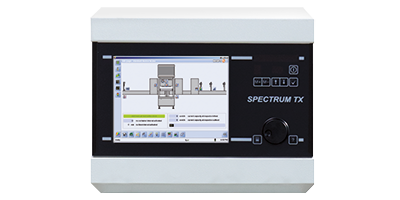 The HEUFT SPECTRUM systems with their modular design can be extended at any time. 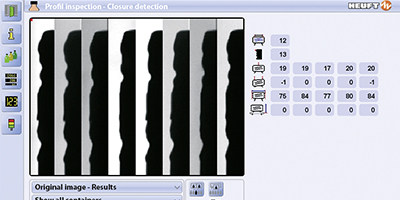 Thus the range of functions of the HEUFT canLine can be optionally expanded with a detection unit for an optical 360° inspection of the outer walls. 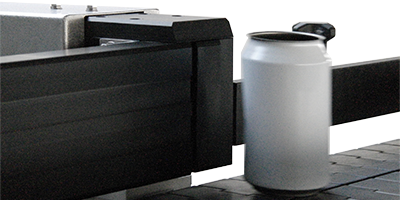 In this way scratched, misprinted and non-brand cans can be tracked down and sorted out even before they are filled. The high-performance image processing system with teaching in capability remembers individual quality requirements in the course of this. This ensures that only those cans reach the market which have a perfect appearance and have been filled with the correct brand. 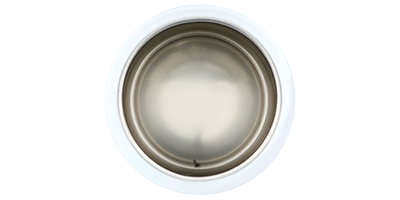 The HEUFT pusher rejection system is ideally suited for the reliable rejection of faulty empty cans even in the high-speed section.